Dear Aspirants, Our IBPS Guide team is providing new series of Reasoning Questions for LIC AAO Mains 2019 so the aspirants can practice it on a daily basis. These questions are framed by our skilled experts after understanding your needs thoroughly. Aspirants can practice these new series questions daily to familiarize with the exact exam pattern and make your preparation effective. - Eight persons B, C, D, H, M, N, T and V are born in 5th and 12th of the four months viz., March, June, September and December of the same year. They are all like different fruits viz., Kiwi, Guava, Papaya, Peach, Mango, Banana, Apple and Orange but not necessary in the same order. H and the one who likes Kiwi are not born in the same month. 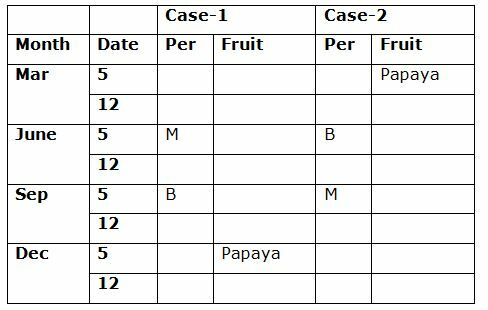 Only three persons are born between the one who likes Papaya and M, who was born in one of the months which has even number of days. Only one person born between the one who likes Papaya and B. C does not like Orange. The one who likes Apple was born immediately before T. M does not like Apple. 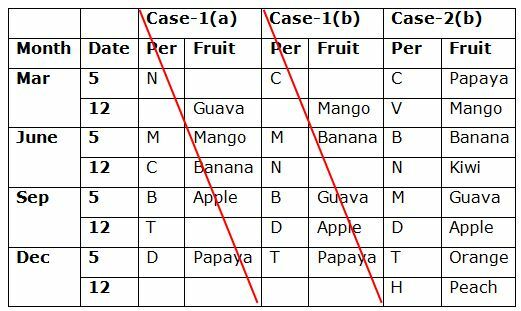 Only two persons are born between N and C. The one who likes Guava was born immediately after N, who does not like Papaya. Only two persons are born between D and the one who likes Banana. As many persons born between B and the one who likes Orange is same as between H and the one who likes Kiwi. The one who likes Kiwi does not born in the month of September. M does not born in even numbered date. As many persons born after T is same as born before the one who likes Mango. 1. H likes which of the following fruits? 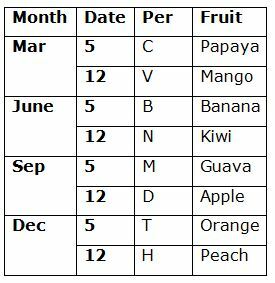 Only three persons are born between the one who likes Papaya and M, who was born in one of the months which has even number of days. M does not born in even numbered date. Only one person born between the one who likes Papaya and B. The one who likes Apple was born immediately before T. As many persons born after T is same as born before the one who likes Mango. M does not like Apple. Only two persons are born between N and C. The one who likes Guava was born immediately after N, who does not like Papaya. Only two persons are born between D and the one who likes Banana. As many persons born between B and the one who likes Orange is same as between H and the one who likes Kiwi. H and the one who likes Kiwi are not born in the same month. The one who likes Kiwi does not born in the month of September. C does not like Orange. So, Case-1(a) and Case-2(b) will be dropped. 2. Which of the following combination is true? 3. How many persons are born between B and the one who likes Orange? 5. The one who likes Banana was born in which of the following dates? ‘Corruption decides result’ is written as ‘*V19 #L14 #V20’. 6. What is the code for ‘Maximum Retail’? 7. What is the code for ‘Goods Carrier Vehicles’? 8. Which of the following is coded as ‘#Z14 *L7’? 9. What is the code for ‘Match Fixing Scam’? 10. What is the code for ‘Administrative Details’? Eight persons B, C, D, H, M, N, T and V are born in 5th and 12th of the four months viz., March, June, September and December of the same year. They are all like different fruits viz., Kiwi, Guava, Papaya, Peach, Mango, Banana, Apple and Orange but not necessary in the same order. 1) H likes which of the following fruits? 2) Which of the following combination is true? 3) How many persons are born between B and the one who likes Orange? form a group. Which one of the following that does not belong to the group? 5) The one who likes Banana was born in which of the following dates? 6) What is the code for ‘Maximum Retail’? 7) What is the code for ‘Goods Carrier Vehicles’? 8) Which of the following is coded as ‘#Z14 *L7’? 9) What is the code for ‘Match Fixing Scam’? 10) What is the code for ‘Administrative Details’?